Unlimited Calls Monthly Package for Philippines Landlines | Free Pc to Phone Calls, Free Voip Calls to India International ! Philippines is one of the most called countries in the world. So many people have asked about cheap calling solutions for Philippines. Calling rates are very high for this country as most telecom provider are charging way to high for international calls. Using voip services to make calls to Philippines is the only solution. However the voip providers also charge high. 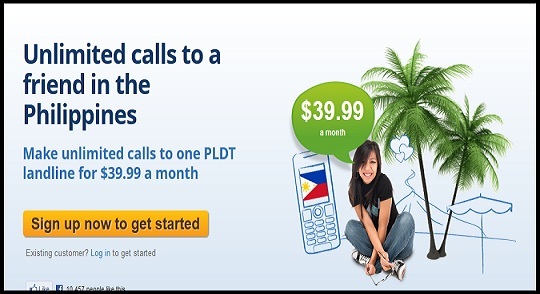 Whatever free calls offers we have got for Philippines are limited to short duration. What people actually want is either cheap pay as you go option (which cost them max 5 cents per minute) or they want any unlimited plan (monthly calling plans). We asked many people about their requirements (people who are living in USA and are making calls to Philippines). What we found was pretty interesting, that you guys generally call few particular phone (and not just too many). This is because you generally make calls to either a friend or family in Philippines and these are limited in number. So the hunt goes for a monthly unlimited package for calling one/two particular Philippine mobile or landline. Though Air4 offers such unlimited plans (which are infact great), but they are capped with 20 minutes duration for each call (and max number of calls). Plus they have temporarily suspended the signups. To our surprise, Localphone offers such exclusive packages. That is, "Unlimited Calls to One Philippine Landline". Localphone recently launched this new product where customers can make unlimited calls to a friend in the Philippines for £24.99 / $39.99 a month. The package applies to one PLDT landline and customers will pay £24.99 a month plus a one off activation fee of £24.99. High quality calls connected through PLDT, the leading telecommunications provider in the Philippines. You can call PLDT landline and Landline Plus numbers. Tell your friends and family to get a Landline Plus number to make their landline portable. Good thing about this offer is no daily limits (make as many calls as you like and talk for as long as you like). Call from anywhere in the World using your WiFi or 3G connection so you can call no matter where you are in the World. Please note that if you frequently call a friend or relative who has a PLDT landline this plan is perfect for you. There's no contract so you can cancel the plan at any point by contacting us. If you have already made a monthly payment you will still be able to make unlimited calls until the end of the month. As the plan is a bit costly just make sure you are clear about everything you need to know. Once you have made up your mind, just go ahead with the monthly calling packages. If you have any questions, shoot them to us in the comment section.